You do not need a top of the range machine for machine quilting, the most important essential is to know your sewing machine well. When operating your sewing machine you should fully understand it and feel comfortable with it. A sewing machine that has constant tension problems and overheats after long periods of use is not going to make machine quilting a pleasurable experience. It is important to keep your machine clean and in good working order. Refer to your owner’s manual for tips on how to clean and oil your machine. Have your machine serviced once a year. Machine feet should be easy to change and put on. Up and down needle feature. Ability to easily adjust the stitch length and width. Perfect tension adjustment no matter what combination of threads are used on the machine. Sews for hours at high speed without overheating. The walking foot also known as the even feed foot or dual feed. 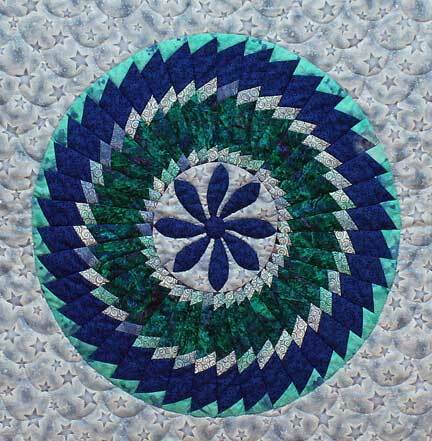 It allows all three layers of the quilt to feed evenly together with out shifting when stitching on the quilt sandwich. The feeders on the walking foot work in conjunction with the sewing machine’s feed dogs to keep the top and bottom layers even. The walking foot is used when stitching in the ditch (SID), straight stitching and also for gentle curves. Many sewing machines are now manufactured with an inbuilt dual feed, often referred to as an IDT. The darning foot allows you to stitch in any direction without turning the fabric. The darning foot jumps up and down with the needle as you sew and it is this action that allows you to sew in any direction without turning the fabric. When free-motion quilting with the darning foot, you need to drop or cover your feed dogs.